Much of my day-to-day work at Advance CTE involves examining national trends in CTE topics, looking at several states at once, so it is always exciting when I get the opportunity to dive deeper into one state’s system. Recently, I was able to do that as part of Vermont CTE’s strategic planning process, launched by Vermont’s State CTE Director, Jay Ramsey. 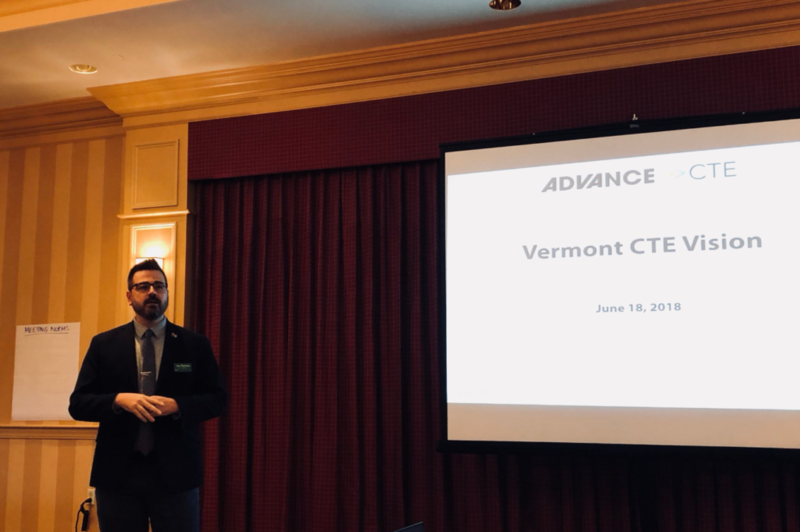 Vermont CTE is partnering with Advance CTE to plan and facilitate a strategic planning process that pushes CTE forward in the state and incorporates feedback from a large number of stakeholders. The work began in February 2018, as we held several conversations with Ramsey and his office about their goals for this work and for the CTE system. In March, Vermont released a statewide survey, which received almost 1500 responses from a variety of stakeholders, including current and former students, families, employers, teachers from both CTE and non-CTE classrooms, as well as representatives from postsecondary. I also conducted ten phone interviews with key stakeholders across the Vermont education and workforce development system. Both the survey and phone interviews asked respondents a variety of questions about their perceptions of the Vermont CTE system, including quality, rigor and accessibility. This data provided valuable insights into how the system serves learners, and I particularly enjoyed interviewing two current CTE students, both of whom were excited about their program and easily able to describe what their potential future careers looked like. All of this engagement culminated in a day-long interactive strategic planning workshop in Burlington, Vermont on June 18. Advance CTE’s Deputy Executive Director, Kate Kreamer, and I led and facilitated the workshop, which included not just state CTE staff, but around 30 representatives from a range of stakeholder groups, including local CTE programs, postsecondary institutions, state legislators, industry partners and workforce development. During the workshop, stakeholders examined the data on perceptions of CTE in Vermont and drafted a series of goals and strategies designed to help learners succeed within the state of Vermont. We guided them through a series of exercises to help them understand the needs of learners as well as the needs of other stakeholders and pushed them to work with each other and take ownership over these goals and their role in helping Vermont achieve them. Going forward, Ramsey will work, with assistance from Advance CTE, to refine the vision and goals, gathering input from more stakeholders, including Vermont students. He plans to present the state’s new strategic vision for CTE to the State Board of Education later this Fall. We are excited to continue this work and follow the developments from Vermont. Putting Learner Success First: New Resources, New Supporters & More! In May, Advance CTE and six partner organizations releasedÂ Putting Learner Success First: A Shared Vision for the Future of CTE, establishing a bold vision for all of education, which includes, but is not limited to Career Technical Education (CTE). Since the release, tens of thousands of copies have been distributed across the country and state and local leaders have begun to signal their commitment to its implementation. To support leaders at all levels turn this shared vision into a reality – and truly support ALL learners on their paths to career success – Advance CTE has created a number of resources and materials. We will continue to build and share new tools and resources in coming months. Want to help spread the word about the shared vision? Check out our tips for sharing Putting Learner Success First or dive right in and use our PowerPointÂ and talking points. Looking to make the case to state CTE leaders? Use this two-pager to get started. Or, want to understand what work is already underway to support the vision’s principles and actions nationally? Review this chart of aligned national efforts to track progress andÂ seeÂ where new investment are most needed. We are so excited to announce that SkillsUSA andÂ Family, Career and Community Leaders of America (FCCLA) have both officially signed on as supporters to Putting Learner Success First, joining the original seven supportive organizations! As two of the leading Career Technical Student Organizations in the country, they support the leadership, technical and academic skills of learners in all 50 statesÂ -Â serving over 450,000Â learners and instructors. You can read their sign on letters here and be on the look out for their guest blogs soon. Finally, we recently created a sign on campaign, where leaders and supporters at all levels can show their support for the shared vision. We encourage you to join your peers from across the country and sign on today! Career Technical Education (CTE) is one education delivery mechanism that is redefining the mission of Americaâ€™s high schools, according to a recent paper. In the paper, the Educational Testing Service (ETS), a non-profit organization that creates research-based assessments, lauds NASDCTEcâ€™s new vision for CTE as â€œa strong indication of the continuing efforts to improve CTE.â€ Specifically, the authors wrote about the State Directorsâ€™ intent to ensure that standards are internationally-benchmarked and a rigorous blend of academic and technical content. While the authors convey that more work is needed to improve CTE, they also support CTEâ€™s integrated approach and opportunities for applied and academic learning. While educators in the United States have looked to high-scoring countries for examples of educational excellence, the report says, they often overlook a key point â€“ these countries are using CTE approaches. The results are impressive: â€œAnalysis of international data found that nations enrolling a large proportion of upper-secondary students in vocational programs have significantly higher school attendance rates and upper-secondary completion rates.â€ Still, the report points out, all students need more guidance and career counseling to help navigate options and prepare for college and careers. NASDCTEc members, click â€œCareer Technical Educationâ€ then â€œCTE Success Mapâ€ to view high-achieving CTE programs across the nation! Read more about CTE in the â€œDifferent Pathways to Life Destinationsâ€ chapter of the ETS report. Secretary of Education Duncan’s remarks!Â Dave Buchholz shares top CTE marketing tips! We wanted you to know about two new resources for you from the Joint NASDCTEc/OVAE Spring Leadership Meeting. This year, as we have been moving forward with the vision for Career Technical Education (CTE), several State Directors have shared with us a mix of implementation stories that been enlightening, fascinating, and moreover, we believe to be very useful to share with other State Directors as a wealth of information, loaded with â€˜toolboxâ€™ strategies to use as they make the journey within their own states. Mike Raponi, State Director from Nevada, has submitted his journey in his own words, which will now be shared with you. Â â€œI have felt as though I am in a very interesting position.Â I have worked in CTE at the Department of Education for over 20 years and have served a long stint as acting director.Â I have now been in this job officially for about six weeks and things feel very different, much different than I thought they would.Â It is very exciting. Establish criteria to change, improve and develop CTE programs based on real and projected labor market needs. Thank you, Mike, for sharing your story. State Directors, if you would like to share your vision implementation story, please e-mail Ramona Schescke, NASDCTEc Member Services Manager at rschescke@careertech.org. State Directors and Members, as we have been moving forward with the vision for Career Technical Education (CTE), several State Directors have shared with us a mix of implementation stories that been enlightening, fascinating, and moreover, we believe to be very useful to share with other State Directors as a wealth of information, loaded with â€˜toolboxâ€™ strategies to use as they make the journey within their own states. Today we want to share Montana’s journey with you,Â provided by Kathy Wilkins,Â Perkins Accountability Specialist of the Montana University System. Advisory Council Identified: We identified our advisory council as the perfect vehicle for helping state staff get the word out and at the same time, further define their roles as state leaders of CTE. Â What Made the Difference: We significantly underestimated the enthusiasm and brainstorming that went on.Â In fact, the focus group discussions went way over the allotted time with the wrap up reports given after the meeting was over.Â In previous council meetings, members were anxious to leave and often did not stay through the whole meeting.Â We feel what made the difference was the focus on a common purpose and ability for each member to contribute.Â These factors really engaged the council members.Â We had set a goal for groups to meet at least once before the next council meeting in February of 2011.Â The committees exceeded our expectations meeting numerous times and developing a number of action items for their groups to tackle. 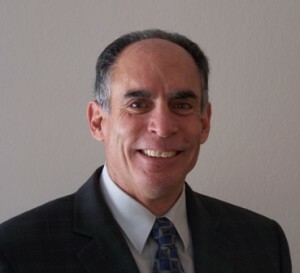 Montana has experienced almost a complete restaffing on the postsecondary side which has stalled the process slightly but also gives the new staff a fantastic foundation.Â As NASDCTEc informed you in a recent blog, Montana recently welcomed a new State Director, Dr. John Cech. Submitted by Kathy Wilkins, Perkins Accountability Specialist of the Montana University System. Ms. Wilkins can be reached at kwilkins@montana.edu. Â You can share your stateâ€™s vision journey too. Contact Member Services Manager Ramona Schescke for more information at rschescke@careertech.org. During a workshop session facilitated by Langdon Morris of Innovation Labs, Fall Meeting attendees learned about the â€œlevers of changeâ€ though a series of case studies aimed at highlighting how companies have transformed their brand, their strategies and their vision. Lessons learned at this session were translated to how State Directors and the CTE community can transform CTE by putting the new vision, Reflect, Transform, Lead, into action as attendees worked together in small groups. One of the takeaways from this session was that failure is not always a bad thing because the faster you fail, the quicker you can reach success. Innovation Champion â€“ he or she encourages risk taking and experimenting; serves as the bridge between strategy and the innovation process. Leader â€“ a leader will move the organization towards change by influencing the system and supporting innovation. These three players must work together in order for change to happen. Who serves in these roles in your organization? In theme with our Fall Meeting — Leading to Transform: Taking Us Where We Should Be — members last week explored the principles of innovation and transformation. Â The discussions were led by Langdon Morris, author of Permanent Innovation, who underscored the critical need for organizations (businesses to non-profits) to keep pace with the changing world. Every organization has a life cycle and arrives at a point where its future rests on its ability to adapt at a critical, transitional time. If an organization does not have a strategy, they will likely become obsolete. In the world of education, State Directors must take a leadership role to implement change, applying the critical traits of strategic thinking, communicating, planning, managing. The global economy, technology and other influences of the changing world requires CTE to be ready to embrace change. Is this a word you associate your work? How many students do you think characterize their experiences in the classroom as joyful? 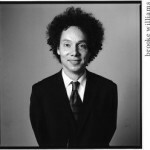 Yesterday, I had the great fortune of hearing Malcolm Gladwell speak at Appleâ€™s Education Leadership Summit. He spoke about the necessity of creating the conditions under which students and workers can produce meaningful work. What constitutes meaningful work and why is it important? 1. Autonomy â€“Meaningful work is work that is autonomous. Autonomy, while often characterized as independence, is really about empowerment. Empowerment to be in charge of your own destiny and to make decisions. 2. Complexity â€“ Meaningful work is complex. People are motivated by work that is challenging, brain-stretching and hard-to-solve. The process of finding a solution to a complex challenge involves accessing information and partnering with others; it means trying and failing and having the persistence and passion to push forward and try again. Gladwell framed it as work that is â€œbeautifully difficult.â€ What a powerful description! 3. Connectedness between effort and reward â€“ Meaningful work requires there to be a relationship between effort and reward. People are motivated by daily progress and movement toward a goal. Getting up each morning and knowing you have another shot at the challenges that face you is exhilarating to those who have meaningful work. The connectedness between effort and reward encourages curiosity and experimentation. One who has meaningful work chases ideas with enthusiasm and seeks out new challenges. In summary, meaningful work = motivated, dedicated, happy (joyful) employees who are reliable, innovative and successful. I feel very fortunate to have the opportunity to do meaningful work each and every day. Do you? As leaders, what can you do to create an environment that promotes meaningful work? The unveiling of NASDCTEcâ€™s new vision paper at the Spring Meeting last week spurred comments from partners/education stakeholders who said the vision can set CTE on a course that breaks through silos constructed by bureaucracy, legislation and traditional approaches to education. They advised the CTE community to move forward in that direction. Representatives from the Institute for a Competitive Workforce, National Education Association, National Association of Secondary School Principals, and the National Governors Association provided insight on their views of Reflect, Transform, Lead: A New Vision for Career Technical Education â€“ NASDCTECâ€™s new document intended to guide the transformation of CTE as the nation responds to the global economy. While all panelists held different perspectives, they shared interest in the vision paperâ€™s concept of developing CTE into a comprehensive program that prepares students of all ages for the workforce through college and career readiness. Indeed, business and industry are seeking more students who fit that readiness criteria, said Karen Elzey, ICW Executive Director. In fact, industry is searching for more students who earn certifications or industry credentials from two-year institutions. That means CTE would best work with industry if it can show demonstration of or interest in creating programs â€“ from secondary to postsecondary — that set students on course to earn such credentials, Elzey said. The challenge will be collecting and providing return on investment data that proves programs can or have the potential to educate and train students. This effort would require partnerships with secondary and postsecondary institutions, and business and industry. Further, to gain support from industry, the CTE community will have to do a better job at providing clearer, simpler explanations of what programs of study are and how advocates can become involved in their success, Elzey said. The lack of clarity makes it difficult for the two sectors to communicate and find common ground. Somehow, education and industry need to find a common language so they can work together. What credentials are valued in the education market? Focus on the associations and businesses that are already interested in CTE. Policies play a significant role in how CTE can be implemented. A broad approach to delivering comprehensive CTE programs to all students should open discussions about legislative opportunities beyond the Carl D. Perkins Career and Technical Education Act, said Donna Harris-Aikens, NEA Policy Advisor. She suggested NASDCTEc explore alignment opportunities in the Elementary and Secondary Education Act, and policy-driven projects such as the Common Core. Also, NASDCTEc should conduct outreach to all congressional members, not just those who belong to the CTE caucuses. Take hold of any opportunity to cross-pollinate the message about CTE, she advised. The message of CTE is traveling through the circles of school principals, said Mel Riddle, NASSP Associate Director of High School Services. He said many but not all principals recognize that CTE provides students with multiple pathways to success. Riddle said more needs to be done to increase the presence of CTE in secondary schools. Currently, principles are bounded by shortage of CTE classes and increased core graduation requirements, which make it difficult to usher students into good CTE programs. Perhaps access to CTE programs would increase if the value of CTE was clearly and effectively articulated, David Wakelyn, NGA Center for Best Practices Education Division Program Director. He suggested a marketing effort that would underscore the value of CTE and programs of study as a way for â€œpeople to commit their kids to something that shows the future for them.â€ He also noted policymakersâ€™ outdated recollection of CTE, which still brings visions of limited, skill-focused vocational education courses to mind. Also, Wakelyn embraced the vision paperâ€™s notion of ridding of the â€œfalse dichotomy of college and career readiness.â€ He added that college included two- and four-year institutions, saying that other nations in Europe have increased their college success and competitive advantage by stepping up student achievement at two-year institutions. As conversations move forward regarding common academic standards, Wakelyn told NASDCTEc to be equipped to demonstrate where technical standards align with the Common Core. CTE is expected to be part of that conversation.